I chose a back-to-basics Homespun Holidays theme for the Dining Room back in 2015. I pulled out all the stops, too! I used a lot of homemade and wooden ornaments, ornaments containing natural elements such as straw and pinecones, hand-made copper pieces from my collection, and of course dishes to match the theme. I created three different table settings during that Christmas, so for the next three weeks, I will share them with you. The first setting I chose was an afternoon tea for six. I used the white hemstitched tablecloth and matching napkins as the base for the setting (Walmart), and green-and-white hand-woven placemats from Wales (thrift store) were placed at each setting. They’re reversible, too, as I will show you next week. Are they quaint! I found the plates at a local thrift store. There were four in a box called Holiday Cheer by artist Warren Kimball and four in a box called Stocking Cats by Fiddlestix both marketed by Oneida. I used all four of the Holiday Cheer plates and two of the Stocking Cats plates at this table setting; the other two Stocking Cats will be featured in next week’s posting. I used Fiesta cups and saucers (found in various places) in coordinating colors at each table setting; Scarlet, P86 Cobalt, P86 Yellow and Cinnabar, and Ironstone Antique Gold and Turf Green (more on Ironstone later!). The flatware is copper clad and is made by Gibson and marketed through Ruff Hewn (Herberger’s). Anchor-Hocking’s Berwick water glasses (thrift store) added to the whimsical table setting, and at each place setting were sisal seal ornaments found at Pier 1 Imports to serve as place card holders. At the hostess’ place setting is a bronze colored reindeer bell ornament (K-mart, Herberger’s or Walmart, not sure which one), and an ivory tea pot made for Starbucks and a sugar and creamer set found in The Mansion when I purchased it, the tea pot and sugar and creamer were on a Fiesta P86 medium platter. 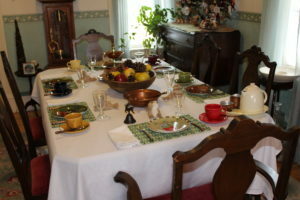 The centerpiece consisted of a wooden bowl found in the basement of The Mansion filled with pinecones and faux fruits. Serving pieces are a hand-hammered copper bowl given to me by my friend, Susie Leonard, which was once owned by a shepherd, and a three-tier tray in rich browns found at a local thrift store, manufacturer unknown at this time. This was a fun table setting as I really had to think which cups and saucers-and other pieces-would go best with each individual plate. More next week!